STARup will host the iconic STARx talks as well as key knowledge sessions that will appeal to wider audiences. it will also be the venue for just 10 handpicked startups to pitch their business to our glittering investor pool. 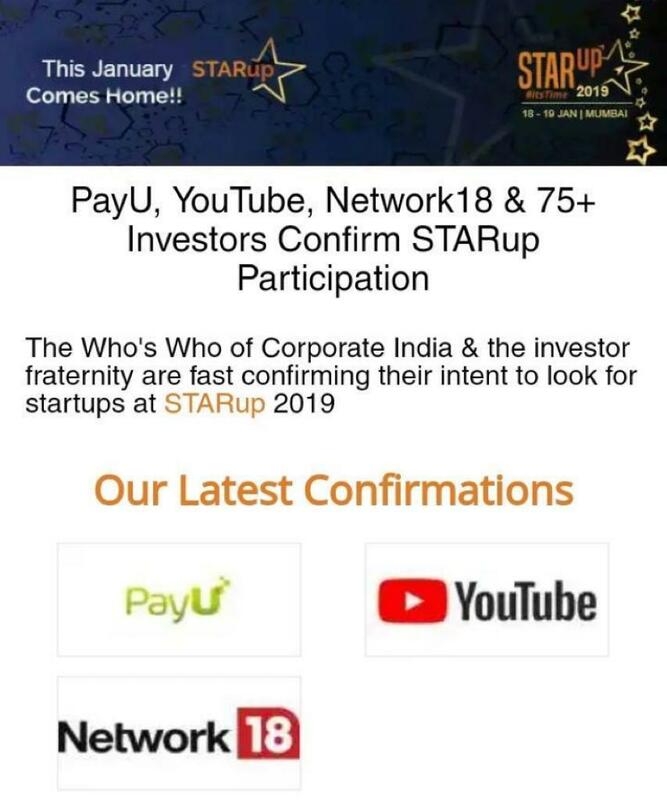 A cosy setting where aspirational individual achievers from the startup ecosystem will share their stories, their philosophies and their success secrets. Fireside will range from Fireside Chats, to Ask Me Anything Sessions, Vertical focused discussions and Masterclasses; content that will help drive business to the next level. Inception is the track focused on innovation, disruption, unreasonable growth and game changers. Achievers, young guns, maestros will all mix and merge perspectives at this venue to give a glimpse of what the future hold for young business. Bitcoin, blockchain, IoT, AI, eMobility, Emerging Tech are some of the candidates for topics that will see an intense exchange of views and knowledge at Spotlight. STARup's glittering cast of investors allocate their time for intense, pre-slotted, 30 minute meetings with Gold pass startup attendees. 10:00 AM -10:30 AM - STARx Talk by Kuntal Joisher on "Find your own Everest"
11:15 AM -11:30 AM - Unstoppable: Session by Janvi Chitalia on "Unlocking Productivity With Nutrition"
11:45 AM -12:30 PM - Session by Anurag Batra on "The Future of Media & Entertainment - What We Will Look For From Startups"
12:45 PM -01:30 PM - Fireside Chat with Jitendra Gupta on "What it takes to build & scale a startup in the Indian Paradigm"
10:45 AM -11:30 AM - Session by Govind Shrikhande on "Kabhi Khushi Kabhi Gam"
11:45 AM -12:30 PM - Session by Yashovardhan Gupta on "From Trendy to Trending - Creating a niche in the competitive fashion marketplace"
12:45 PM -01:30 PM - Session by Anoop Menon on "Building Businesses on Mobile"
10:45 AM -11:30 AM - Session by Ramesh Bhaskar on "Video As An Effective Marketing Tool"
11:45 AM -12:30 PM - Session by Sanjay Mehta on "Future of Blockchain Applications"